Today was Day #2 of Chocolate, Date and/or Fig Theme Week. 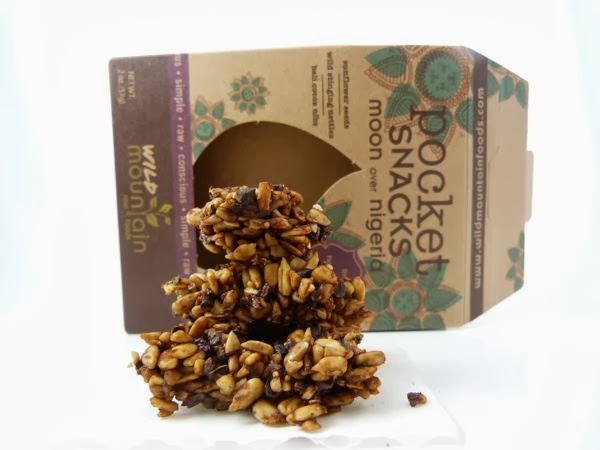 What is "Moon Over Nigeria" and what does it have to do with chocolate, dates or figs? A product moniker like this conjures up exotic imagery of moonlit evenings in foreign lands. 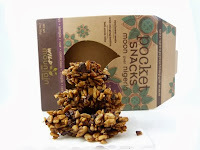 However, most of the ingredients in today's Pocket Snack blend from Wild Mountain Raw Foods (Gunnison, CO) originated closer to home. Organic sprouted sunflower seeds; organic figs; local raw honey; wild stinging nettles. Organic, raw bali cocoa powder and nibs, and cinnamon, added some rich flavor, warmth and international cachet to this mix. The result: a crunchy, crumbly, mixture of natural ingredients that was a healthy, not-too-sweet snack to munch on during the day. Also, for those restricting their wheat intake, suffering from a peanut allergy, or choosing a vegan diet, this snack was "processed in a gluten-free, peanut free, animal free facility."